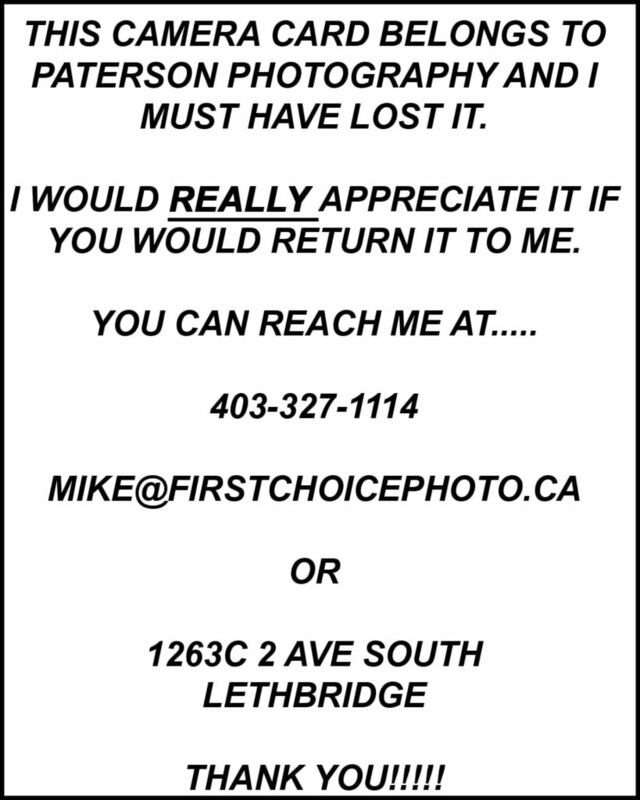 Free security and a little piece of mind - Paterson Photography Ltd.
Free security for a camera card! The other day a client came in and told me he lost a camera card. This is something that I have always worried about. It was not a wedding or a family shoot so that was good. But it had a lot of potentially valuable images that he had just shot. This got me thinking what could a person do to help get a card back? Well I came up with an idea, after we format a camera card we should be shooting a picture of a business card or any information card (we could make one on the computer and print it out – see below) that has our name, phone number, email, etc on it. That way if someone finds it and looks through it they know who it belongs to. Do not write your information as it is hard to read a lot of peoples writing, but use something that is printed in a nice clear font! This is not to say that everyone will return the card or even look through the images. But at least it gives them an opportunity to do so. You could also shoot it off a monitor but be careful that it is readable. I am laminating one now and I will start to do this each time I format my cards. May not be 100% foolproof but better than nothing! I also thought of adding a part about a reward will be offered. It would not hurt especially if it was a wedding!! !